The art of Yoga hardly seems to be a passing fad, and now it has found a comfortable home in many churches, including Adventist. “Be still and know that I am God,” comes the rallying cry from a mainstream church that has built an entire ministry around the practice of Yoga. This all sounds fine and good; after all, worshiping God as God is the essence of true worship. 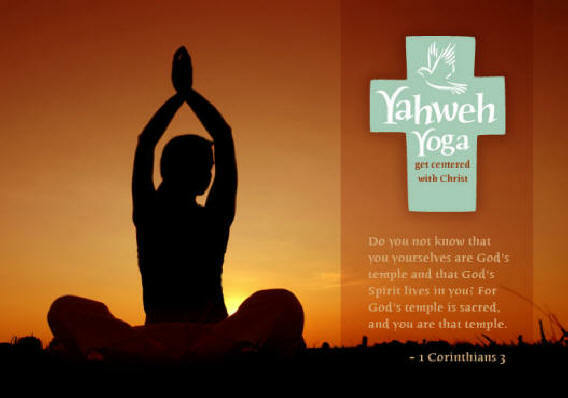 But is “Christian Yoga” really as compatible with Christianity as its name implies? Before we address in too great of detail anything about Yoga, let’s simply turn to the Bible to lay groundwork. The overriding question in all of this is simple: does God care how we worship Him? Amid the thundering and fire of Mt. Sinai, the Lord gave to Moses the two tablets of stone. “You shall have no other gods before Me…you shall not bow down to them nor serve them. For I, the Lord your God, am a jealous God…” (Ex. 20:3, 5). The mandate to serve God and God alone had been reestablished at Sinai for a generation that had been raised in pagan Egypt. Some years later, after the deaths of Moses and Joshua, “when all that generation had been gathered to their fathers, another generation arose after them who did not know the Lord nor the work which He had done for Israel. Then the children of Israel did evil in the sight of the Lord, and served the Baals…and they followed other gods from among the gods of the people who were all around them…” (Judges 2:10-12). Recall the story of Balaam. Curses could do nothing to harm the people of God, but intermingling with their pagan neighbors brought them to apostasy. The passage does not state we should never associate with others. A light under a bushel is no light at all! But it does give a grave warning of what becomes of the church that comingles its worship with that of the world. “And the people began to commit harlotry with the women of Moab. They invited the people to the sacrifices of their gods, and the people ate and bowed down to their gods. So Israel was joined to Baal Peor, and the anger of the Lord was aroused against Israel” (Numbers 25:1-3). From here let’s jump to Revelation 14, a familiar chapter in Adventist eschatology. The three angels’ messages came as a precious warning from God at the onset of the time of the end. “Fear God and give glory to Him, for the hour of His judgment has come, and worship Him who made heaven and earth, the sea and springs of water” (Revelation 14:7). This is the first angel’s message. The second states, “Babylon is fallen, is fallen, that great city, because she has made all nations drink of the wine of the wrath of her fornication” (Revelation 14:8). Lastly, the third angel declares, “If anyone worships the beast and his image, and receives his mark on his forehead or on his hand, he himself shall also drink of the wine of the wrath of God…” (Revelation 14:9, 10). The three angels’ messages come at the end of time. They are not a new gospel, but the “everlasting gospel.” They contain a bold reminder of God’s creatorship, the utter bankruptcy of the world’s religion, and a solemn warning not to intermingle with the world’s worship. Now what about Yoga? The American Yoga Association assures us that yoga will not interfere with our religion, but is this true? The word “yoga” comes from Sanskrit, and means “union” or “to yoke.” This union refers to the union of the individual and the universal as we will see. Some argue that yoga arose independently of Hinduism, thus it is nonreligious in context. However, our first written records of yoga are found in the Vedas as well as the Bhagavad Gita, sacred Hindu text. [i] Whatever the case, Hinduism no doubt had a strong influence on our modern-day practices of yoga. Around 2,000 years ago, a sage named Patanjali compiled the Yoga Sutras. These took the form of 196 short aphorisms that create the foundation for practically all forms of yoga practiced today. What did Patanjali teach? For one, the ultimate goal of yoga was to achieve a union of the individual with the universal consciousness. Patanjali also developed “eight limbs” of yoga. These include such areas such as ethics, personal conduct, concentration, meditation, and the like. One of Patanjali’s five personal disciplines is to completely surrender to the Divine. [ii] This fact creates a paradox for those who say yoga is nonreligious. The fundamentally flawed issue with yoga is twofold—it elevates man and lowers God. In yoga—“union”—man, through the use of physical and mental exercises, can achieve oneness with the Divine. Naturally, this raises the question “where and who is God?” If God is everywhere and in everything, including ourselves, doesn’t our ability to achieve this “union” on our own terms elevate us to godlike status? The end result is the deification of man. God becomes more of a presence, an energy or force, of which man has ready access to achieve enlightenment. Here the line is blurred between Creator and creation. In light of the three angels’ messages we should be careful to remember our rightful place in relation to the Lord of the universe. Paul warns us of those “who exchanged the truth of God for the lie, and worshiped and served the creature rather than the Creator…” (Rom. 1:25). The issue with yoga also can be seen in the ministry of reconciliation. In the practice of yoga, oneness with the Divine comes through the initiative and efforts of man. The Bible says, “Now all things are of God, who has reconciled us to Himself through Jesus Christ, and has given us the ministry of reconciliation, that is, that God was in Christ reconciling the world to Himself…” (2 Cor. 5:18, 19). The initiative all belonged to God. “”But God demonstrates His own love toward us, in that while we were still sinners, Christ died for us” (Rom. 5:8). Another dangerous element is the introspective nature, the idea that the key to balance and peace lies somewhere within ourselves. This is so dangerous because it mixes truth with error. Often Satan’s most fatal deceptions are composed like this. Meditation is not all bad. David mediated often and wrote of it in the Psalms. “When I remember You on my bed, I meditate on You in the night watches” (Ps. 63:6), and “I will meditate on Your precepts, And contemplate Your ways” (Ps. 119:15). But here is a fundamental difference. Yoga instructs us to meditate within ourselves, while the Bible clearly says, “The heart is deceitful above all things, and desperately wicked; who can know it?” (Jeremiah 17:9). Some will defend yoga by saying, “If we just make God the Divine and meditate on Jesus, isn’t it all fine and good?” Yoga and Christianity come from two fundamentally different viewpoints in regard to God and man. To say they are compatible is to simply ignore the facts of their origins. As Seventh-day Adventist Christians defending yoga, we run aground on two obstacles. First, by claiming yoga can be practiced independent of religion is to completely deny its foundation. Second, to acknowledge its true origin but shrug it off with little regard is to say God does not care how we worship Him. Either way we stand in error. I would reply, but I’m honestly not sure what you meant. I agree with the above article. Let’s set aside yoga, but make sure we stretch our muscles every day. Stretching exercises are a must if you want to remain physically healthy. “the idea that the key to balance and peace lies somewhere within ourselves.”…I was waiting for this. Thank you for saying it. This is why the world (yoga included) will not be saved. They don’t accept the principle of denying self. We live in a ‘self’ centered world. All Adventists should take a pass on yoga. We are glad to have found others who are giving the trumpet a certain sound on this ! That is about the time I picked up a free newspaper in Reno and learned of a Pagan Christmas and how the Wiccans were preparing for it…was blown away and had to find the truth which I did.. recently my niece who is a Wiccan sends me a video about why Christians are celebrating Christmas when it is actually a wiccan pagan holiday. And how about on Holloween…our churches do a harvest festival instead….do people not know that there are children to this day being sacrificed? There was a video put out by non-adventists its called Trick or Treat a film by Jeremiah films made back in 2006 or 07..
Also just found this website by accident which is extremely disturbing!!!!! I am so grateful for this article which gives clarity to this issue. I believe when I was growing up, we were taught not to be involved with Yoga, and now I hear of many SDA’s who are involved in it. Thank you for the clarity this gives.